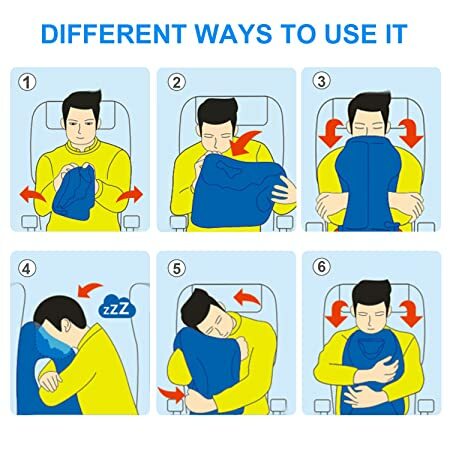 Are you sick and tired of not being able to relax and nap during your flights or train trips? Do you need a practical and lightweight travel pillow that can help you arrive refreshed and full of energy at your destination? FINALLY, YOU CAN SLEEP LIKE A BABY DURING ANY TRIP! - Say goodbye to uncomfortable and hard seat headrest and discover the easiest and smartest way to enjoy a rejuvenating and relaxing nap while traveling. The inflatable travel face pillow is here to make your life easier and your trips 100% more enjoyable! ERGONOMICALLY DESIGNED TO HELP YOU NAP & RELAX! – Have you always been jealous of people who can sleep on a plane, car or train? Not anymore! Our comfortable and supportive portable face pillow is designed to offer you an unparalleled napping experience. You can easily adjust it to your preferred sleeping position and nap like royalty! SO COMPACT YOU CAN FIT IT IN YOUR HANDBAG! – The inflatable travel face and neck cushion is designed with maximum portability in mind. When deflated, its smaller than a book and can be carried in your handbag effortlessly. Plus, all it takes to inflate it is a few puffs of breath and you can decompress it in seconds due to the innovative and handy valve. NOW YOU’LL BE ABLE TO SLEEP ANYWHERE! –Not only is our innovative inflatable travel pillow ergonomic and compact, but it's also extremely comfortable, due to its unique shape and silky smooth, breathable material. Perfect for napping on airplanes, boats, cars and even for a power-nap at the office or at home, the portable face cushion is going to become your ideal companion! NO MORE STIFF NECK & FATIGUE FOR YOU! – This durable and practical inflatable travel face and neck pillow reduces pressure points and stimulates blood flow, offering you a soothing and relaxing sleeping experience. And just to put your mind at ease, we confidently back it with our hassle-free, full refund guarantee! Can you afford to miss out on this unique opportunity? Durable Construction for Long Last: Every single of our INFLATABLE PILLOW is made in a specially chosen material of strong, durable, water-proof and life time guarantee. It is applicable to use in camping, traveling, school, office, airplane etc. 3. After finishing inflating the pillow, please block the valve with the first valve cover soon to prevent air leakage.